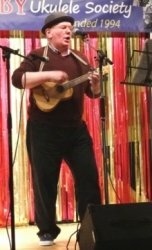 Hello and welcome to the world of Ukulele - a really super instrument where practice and perseverance guarantee success. With four strings the fretting is much easier that five or six string instruments. I am a retired engineer - just before retirement I thought 'What Now' ? And teaching Ukulele is what I do - together with my one man musical show - well it's my 'new' career. I taught engineering systems to repair technicians as part of my other life. My students love playing and the approach I have taken - I have written my own teaching programme and it works. I teach 'new starters' - after three lessons you will be playing songs. In my first career I was a STEM ambassador to schools for my Company (STEM = Science , Technology , Engineering , Maths) and as such had a full CRB check. This has expired - so child protection is managed by a relative being present with any tuition for students under 17 years of age. There is no need to read music , I teach to a programme , written by myself , which is like playing Scrabble - the word game - you learn a chord and play a song - once you have the chords - you can make up 'any word' or play any songs which include those chords. Many of my songs have bespoke backing tracks - you can sing along , follow the tempo and have a great depth of sound. My lessons are £17.50 for 1 hour and 10 minutes - and I offer a Ukulele plus starter lesson for £55. This Ukulele is a real musical instrument - Concert Size with Strap and Tuner.